Lung Hin (龍軒) is the in-house Chinese restaurant of Marco Polo Ortigas Manila serving authentic Cantonese dishes prepared by the restaurant's culinary team. At the helm is Chinese Executive Chef Sunny Cheng, a Michelin-starred chef who brought with him years of experience as a Hong Kong chef. 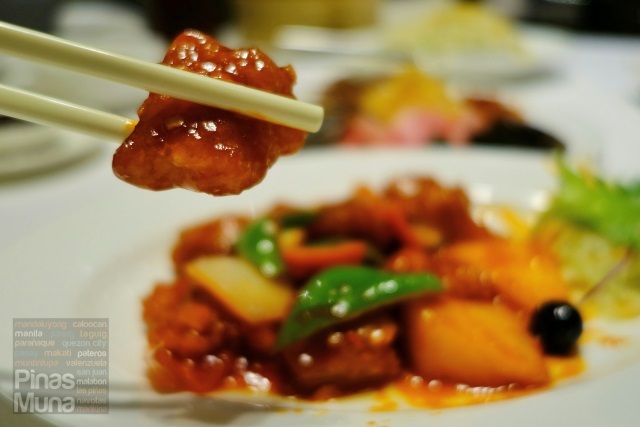 Chef Sunny created contemporary twists to Cantonese classics which guests can only experience at Lung Hin. The restaurant has a modern, chinoiserie chic interior with a spacious main dining area with round tables ideal for families or groups of ten persons. both sides of the restaurant are lines with booths which are divided by glass walls. These are ideal for smaller groups of four to six persons for a more intimate, semi-private dining. Best spot is one of the booths facing the glass window where guests can enjoy a spectacular view of the city. It was during a Weekend Staycation at Marco Polo Ortigas Manila back in December 2014 when we first dined at Lung Hin. That was followed by our second visit last September 2015 when we tried their Dim Sum All-You-Can promo. Finally, to formally welcome the New Year 2016, we are back at Marco Polo Ortigas Manila for a relaxing Weekend Spa-cation, and there is no better place to have our first dinner of 2016 but at Lung Hin. We started the evening with Pan-fried Radish Cake with XO Sauce (P228.00), a Lung Hin signature dish which is made of shredded radish and seasoned with Chef Sunny's home-made XO sauce. It is crispy on the outside and soft in the inside. 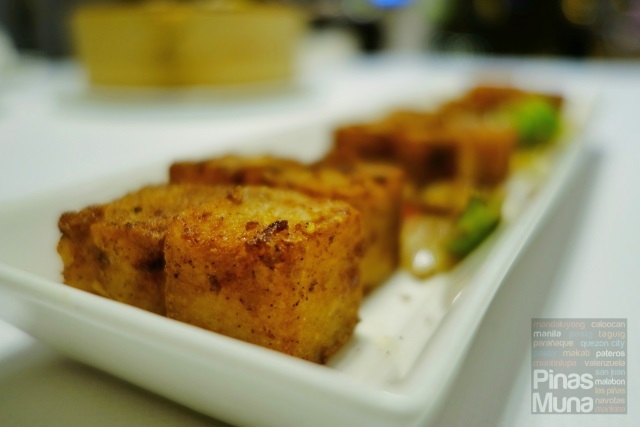 Unlike most radish cake we tried, this one is not oily and slimy. The mildly spicy XO sauce made this dish even more enjoyable. 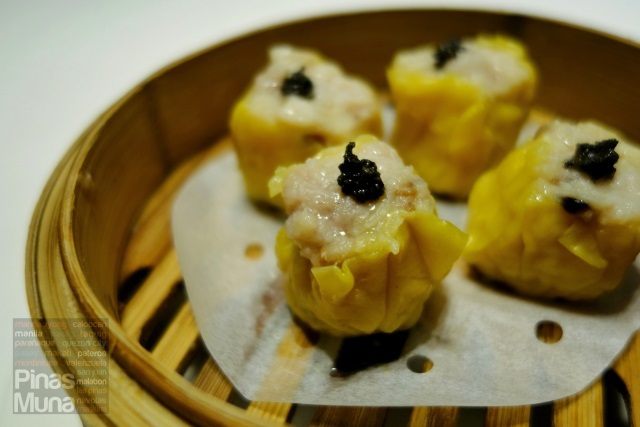 The Steamed Pork Siomai with Truffle Sauce (P228.00) is another Lung Hin signature dish which we always recommend to friends dining at the restaurant. The pork siomai is very compact and not too fatty and the truffle sauce gave it a mild earthy flavor. 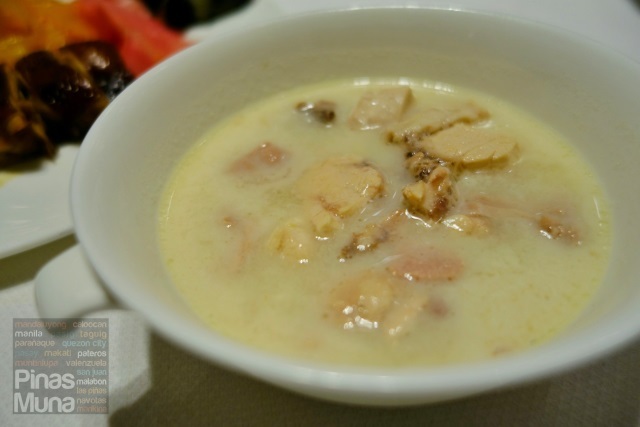 The Double-boiled Chicken with Fish Maw in Almond Essence Soup (P420.00 per cup) is a light and creamy soup with delicate taste of chicken and smokey flavor of sausage. There was no hint of fish at all, this is because fish maw is naturally tasteless and just absorbs the flavors of the soup. Lung Hin serves authentic, Hong Kong-style Crispy Suckling Pig which Chef Sunny makes in-house. It is available in whole (P7,000.00) or half order (P3,600.00), but since it was only me and Edgar eating that time, we won't be able to finish even a half order of it. Lung Hin was kind enough to assemble a sampler platter for us which included slices of Crispy Suckling Pig and other siu mei items such as Barbecue Pork, Soy Chicken, as well as Century Egg wedges, Jellyfish and Vinegar Marinated Ginger. I was totally satisfied with the Crispy Suckling Pig, it tasted exactly the same as the Crispy Suckling Pig meal I tried in a Michelin-star roast meat restaurant in Causway Bay, Hong Kong. The skin was super crispy and the meat was very tender. Lung Hin will definitely be my go-to place when I am craving for Crispy Suckling Pig. Edgar wanted to have noodles so we asked the restaurant manager, Ms. Jennifer Chua, for recommendations. She is, by the way, also a Hong Kong national and very friendly and hospitable. 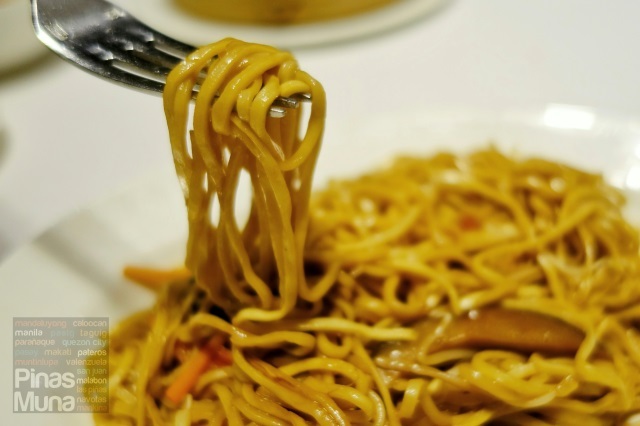 She recommended the Lung Hin signature Pan-fried Crispy Egg Noodle with Prawn Ball and Minced Meat, but because Edgar doesn't eat seafood, we opted for the Braised E-fu Noodles with Enoki Mushroom (P488.00). It wasn't heavy on flavors which makes it more enjoyable to eat. We both loved it. 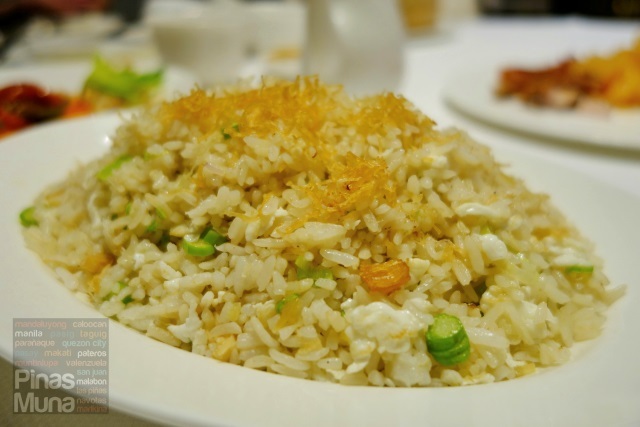 During our first two visits at Lung Hin, we already tried their Yang Chow Fried Rice. It was great but this time we wanted to try something new, something different. Ms. Jennifer suggested that we try the Dried Scallop Fried Rice in Egg Whites (P688.00). It was equally good as the Yang Chow Fried Rice, so good that even Edgar enjoyed it despite the fact that it had dried scallop. Another Lung Hin signature dish we tried that night was the Sweet and Sour Pork with Blue Berries (P488.00) which is a classic dish of pork chunks and pineapples in sweet and sour sauce, but Chef Sunny give a twist by adding blueberries which is an interesting contrast in color and shape. It is remarkable that the pork used in the dish was not fatty. The bell peppers were crunchy and sweet. Here is a Lung Hin signature dish that we tried on our visit to the restaurant. 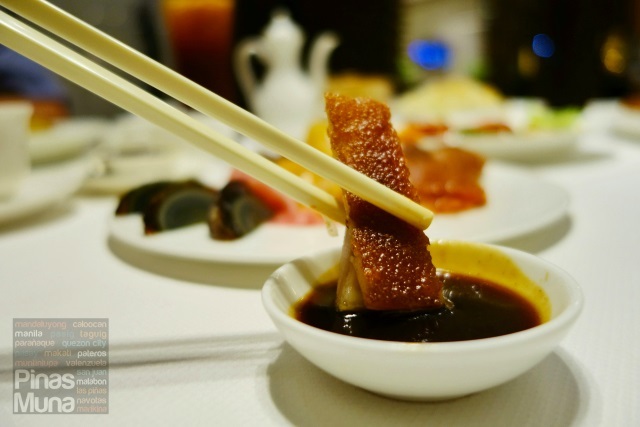 The Sautéed Diced Beef Cubes with Goose Liver (P788.00) is now one of the best sellers at Lung Hin and thought that it worth sharing in this article. It is a generous mix of premium beef chunks and goose liver. It's a very hearty dish that is best with steamed rice. A definite must-try! 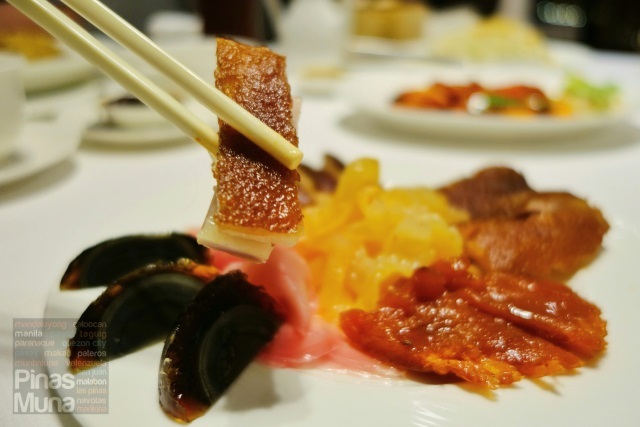 This is very common in Hong Kong, and each restaurant has its own version. Unlike the Tim Ho Wan version that most Filipinos are familiar with, Lung Hin's Baked Barbecue Pork Bun (P288.00 for three pieces) has a slightly doughy bun, almost like a freshly baked pandesal which I find much better than other versions in Manila. 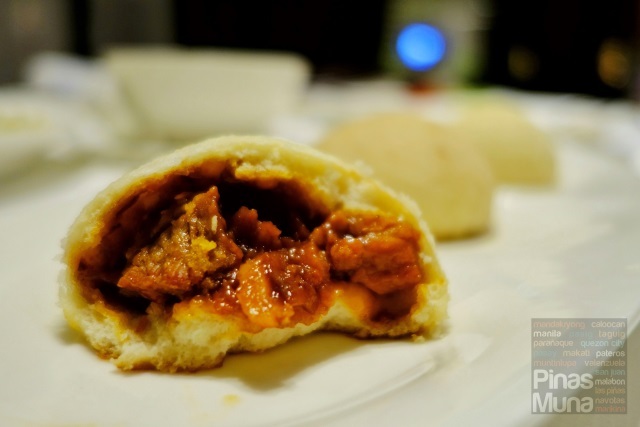 The barbecue pork filling of the Lung Hin pork buns are also chunkier, unlike the other versions which are filled with small chunks of pork and lots and lots of sauce. 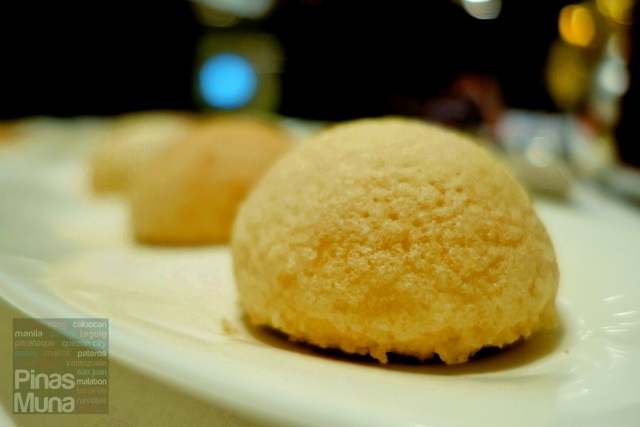 The crust of Lung Hin's pork bun is not too sweet as well unlike that of Tim Ho Wan and TuanTuan. The crust doesn't also crumble. 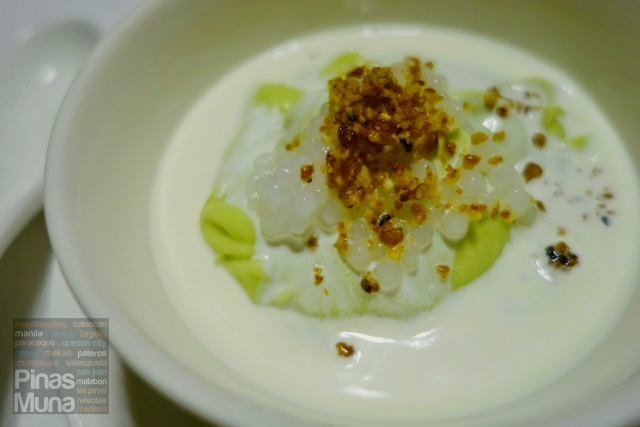 Finally for dessert, we had the Lung Hin signature Chilled Avocado Sago (P260.00). Based on its texture, the avocado is most probably pureed and mixed with milk and coconut cream, topped with sago and sprinkled with a kind of ground nuts. It's not too sweet and is very filling. A single serving is big enough to be shared by two to three persons. So if you are looking for a Chinese restaurant in Metro Manila that serves authentic Cantonese dishes, there's only one place to go. 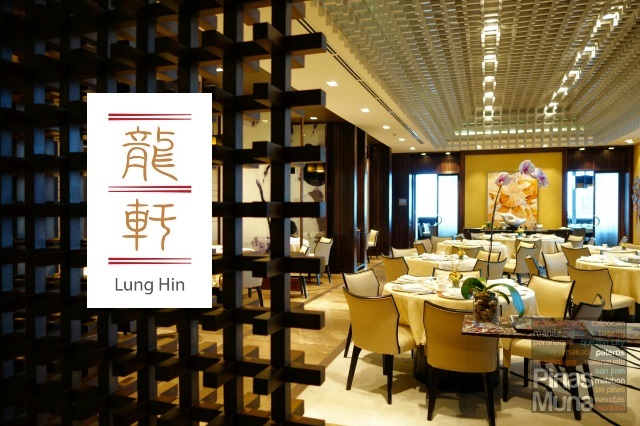 Lung Hin restaurant is located at the 44th floor of Marco Polo Ortigas Manila, along Meralco Avenue (right across Metrowalk Complex) in Pasig City. 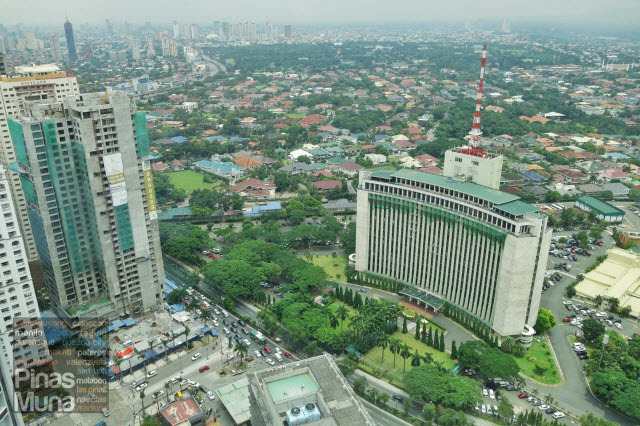 And because Marco Polo is a Hong Kong-based brand of hotel, you can combine your Cantonese dining with a staycation for a complete Hong Kong in Manila experience.